While I’m recovering from our trip, please enjoy this post from Hannah at Unplanned Finance. If you’d like to contribute to Frugal Rules, please contact us. When I told my coworkers that I was pregnant, I expected the many congratulations I received. I expected the truly bizarre and completely unsolicited parenting advice. However, I didn’t expect that nearly everyone agreed that our son would fill our hearts with joy as quickly as he emptied our bank account. 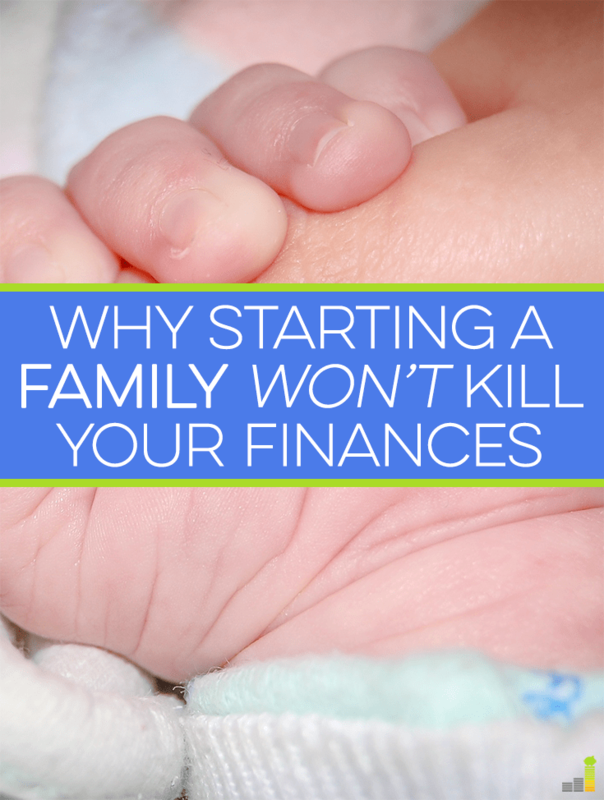 Prior to having our son, my husband and I did not have clear financial goals. Thanks to some generic advice, we had set aside money for retirement and emergencies, but we had no specific motivation to take control of our finances. As a result, we spent and saved our money mindlessly, and we didn’t work very hard to raise our incomes or learn about building wealth. Our mindset changed the moment we learned I was pregnant. Suddenly, we had goals. We wanted to provide generously for our son, and we wanted time to spend with him. We realized that this required gaining control of our finances. As we began slashing unnecessary expenses and stockpiling cash and tracking our spending we realized that we could thrive on just one income. As a result, my husband made the leap out of the workforce and into a full time PhD program (a long-term investment), in the hopes that he can be our primary income earner in a few years. Along our journey we learned that we can provide for our son now, and we can prepare for the future too. More than that, we learned that our ability to control our finances unlocks options that we never thought possible. Today, we are working towards the option for me to stay home full-time even before my husband finishes school. In my opinion, a strong motivation is the single most important factor in your ability to achieve financial goals. When we had our son, we found our why. Our son clarified our financial goals, but we worried that the expense of raising children would keep us treading water financially. Current estimates put the cost of raising a child at around $245,000 over 18 years, but if you look closely at these numbers, you will begin to understand that the true cost of raising a child depends mostly upon lifestyle choices. In the study I cited, nearly 40 percent of the estimated costs of raising a child come in the form incremental expenditures on housing or transportation. 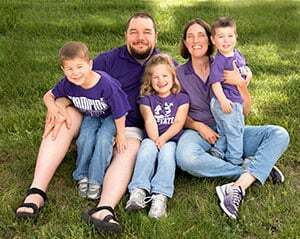 For us, the incremental cost of our son in these areas has probably been about $1,000 which includes a car seat, a bike seat, and the additional utilities to heat and cool his 64 square foot room. I think it’s safe to say, we won’t hit the incremental $100,000 anytime soon. On the other hand, we are likely to blow the estimated $45,000 for childcare and education out of the water. We spend around $13,000 per year for a close friend to watch our son. It would be cheaper (by about a third) to send him to a daycare center, but time after time we’ve determined that the benefits of paying more are worth it to us. As kids get older, the lifestyle part of spending will become even more apparent. Will your kids take private music lessons? Will they play city league basketball or travel league? Will they go to public school, private school or will you homeschool? These questions aren’t just money questions, they are lifestyle questions. While you’ll spend some money no matter what lifestyle you choose, the exact amount is up to you. Lifestyle influences your kid-related expenditures, but it also influences your income potential. For the 12.4 Million American families with a full-time stay at home parent (including 2 million stay at home dads), the connection between lifestyle and income is obvious; their family income dropped by close to half when one partner exited the workforce. Even for dual career families, kids represent obstacles to income growth. With kids, it’s difficult to spend extra hours at the office, to pursue extra degrees and certifications, to move across the country, and to accept positions that require extensive travel. All of these can impinge upon your ability to grow your income. Work opposite shifts. Working opposite shifts can lead to two incomes and low childcare expenses. Opposite shift families have the opportunity to focus on their career since they also can trust their spouse to keep things going on the home front. However, this tends to be a relationally taxing option. Outsource all that you can reasonably afford. For extremely high income earners (think Hollywood celebrities and Silicon Valley Tycoons), spending money on household help (including nannies) is obvious. My husband and I outsource daily childcare, but we don’t feel comfortable spending on additional household help at our current income level. Spend time on professional development. During light work seasons, you can do this during your workday, but even during busy seasons spending time working on your career and not just your project deadlines will make a growing income more likely. I spend about twenty minutes a day reading business books (or Harvard Business Review cases) and blogs to be sure I am developing a strategic mindset. My older sister recently completed her Master’s degree in Education by taking one class at a time for five years straight. Don’t be afraid to hustle. Earning a side income, can be one of the best ways to boost your wealth, and your side hustle, doesn’t have to scar your kids for life. While having a side hustle might make you feel like you have a non-traditional family, there’s a lot your kids will learn from watching you and eventually, possibly even participating in your hustle. You might even be able to grow the hustle into a full fledged family business and you’ll model real life business skills that your kids can apply to their own situations as adults. 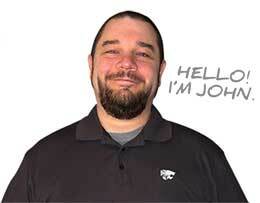 Keep your credentials up to date. The primary income earner should be diligent to keep up on professional development opportunities to boost their earnings in their primary career, but the stay at home spouse should keep their credentials in tact to make re-entering the work force easier. Earn and care for your kids simultaneously. It’s difficult to take care of kids and work at the same time, but I’ve seen some ingenious solutions. My previous babysitter was a mom of three who watched my son and her kids for over a year before she moved. My cousin keeps her hair cutting supplies in her minvan. At baseball games or on play dates, other parents are happy to pay her to cut their kids’ hair. Build a side business even if it is small. My mom spent twenty years as a stay at home mom and she occasionally catered different events; these days she has more catering work than she wants. I have one friend who plans kids’ birthday parties; she manages to run her business during naptime and on Saturdays when her husband watches the kids. When her kids are older, she hopes to build the business further. I have another friend who runs a small photography business and hopes to devote more time to her craft and business once her kids are in school. Why do you think so many equate having children as being expensive? What tips do you have for a parent wanting to care both for their children and grow their net worth at the same time? If you’re a parent, how do you prioritize your time and activities so as to have balance and still make a decent income? Hannah Rounds is a wife and mom who is working towards her version of the American Dream. This dream involves shifting her focus from career to family while creating opportunities for an encore career later in life. Her goal is to help other parents forage similar paths. She writes about this journey at Unplanned Finance. When I and my wife got married, we were not financially ready. The moment we had a baby and we experienced those expenses. It’s like it moved us to get side hustles because we didn’t want to be in great debt. That’s the time we felt that we had to prepare and save money for “the family”. The experience is truly worthwhile. It’s amazing how many stories I hear of others starting to get excited about their finances, once they have a kid. I’m so glad that having a child helped put you on the right financial path too! I don’t have a lot of experience in this (yet) since my daughter is only 4 months but so far in the experience has been a great positive for us financially. The biggest thing that came out of having her, is that it has given us the motivation to make sure we can provide for our family financially. I agree with Hannah that having a family helps to force you to define your goals, not keep you from achieving them. Kids absolutely change your financial goals, but like you said, they don’t have to keep you from achieving them. Congratulations on your little one; I hope you’re getting some sleep. Aw, nice post. I think you have to be mindful and spend within your means. It’s also important to plan ahead for expenses and know whether daycare will be needed. There’s no sense in waiting years and years though – because the reality is that you can wait too long. Spending within your means is so critical as a parent because it also influences your child’s character development. I actually think that there are many parallels to having a child and changing a career (which you know all about)- if you wait for the perfect financial situation, it will never come around. I agree with this 100%! Having kids forced us to rethink our goals and take life seriously in a way we just couldn’t before. Plus, kids don’t have to be that expensive! Stop buying them so much crap, right? Definitely stop buying your kids crap; they manage to bring it into the house anyhow. My son collects sticks and rocks instead of matchbox cars and Thomas. I mean our house is a little dirtier, but he’s just as happy. I think that our son also helped us to take our future seriously- after all, he is depending on us. I think many assume a child is expensive for a few reasons. One, they want the best for their child and think high price = the best. They also never think to dial back in other areas of life to avoid lifestyle inflation. They just accept rising prices and having more stuff means more success. I think this is true. Many parents forget that their child really wants their attention, and are very quick to sign up for expensive child care activities and to buy too many clothes and toys. Yes! There are SO many ways to save on kids. Media will have parents (especially brand new) that you NEED so much crap when the reality is that you simply dont. I bought or received so much i didn’t even use it was unreal but there were a few things I couldn’t have lived without either. Getting pregnant is what put is into high gear for financial motivation too. Oh, I definitely have a list of things that I will never regret buying for my son, but that list is pretty short. I think the toughest for me is “experience spending”, but it’s helpful for me to remember that my son is really happy doing very simple (and free) things. For me it’s not just the financial cost, but also the time cost. I’m sure one day I will want to have kids, but not for at least 5 years. It’s largely financial reasons but time ties into it as well. I realize there are ways to save on having kids, but there is no way I could dedicate as much time and energy to my career or side hustles if I had kids right now. You can save money on having kids, but it’s tough to save time. Of course, childcare helps, but the time consideration should be top of mind for potential parents to be. I agree that having our 2 kids hasn’t been nearly as expensive as many people make it out to be. There are so many hand-me-down or used baby items you can get your hands on. However, I’ve heard from moms of older kids that the costs increase significantly as they have mandatory school fees (even for public schools), supplies, social outings, eat way more, etc. And even if you’re (wisely) teaching them to pay for some of these things on their own, until they are old enough to get a job, a lot of that money is ultimately going to come from you paying them for work. But I completely plan to avoid expensive clothing & shoes, technology, toys, expensive outings or sports teams, etc. No doubt, older kids have more spending opportunities (outside of daycare) than the little guys. This is where the lifestyle decisions become even more important; it’s important to be strategic in your Yes’s (and of course your No’s). I can see how it would be easy to spend every last dime on my kids and still not give them every experience that I want to, so it’s up to me to say Yes and No. To me, a big part of the expense of having children is knowing that one day they will go to college, and I want to be able to pay for that college. By time I have kids in college, who knows how much it will cost! For that reason, I almost can’t worry about it. Oh my, college costs are a bear! My thought is that with dual enrollment options, AP, and other low cost alternatives along with their savings, I think we will be able to help our kids who want to go to college get a degree at a low out of pocket cost. I liked this article even though I don’t plan on having kids. So much of mainstream and my friends talk about how expensive kids are and that I have it so easy by not having kids. But really their financial life is so stressful because they are just bad with money. Kids don’t have to cost a lot and like you mentioned can be motivation to achieve more and set goals. Well, daycare does actually cost some coin, so little kids are pretty expensive if you’re choosing the dual career route, but you’re right. Kids don’t have to yield financial stress, and they don’t have to be super expensive if you are a strategic spender. Great post, Hannah. I am always amazed at the news articles that talk about it being $200-$300k to raise a kid. It really doesn’t have to be that way if a family is willing to practice a little restraint and common sense. It drives me nuts when the media throws around that $245,000 amount as if all kids cost that much. It really does depend on your lifestyle and your choices. I hear the same things as you did from your co-workers. Honestly, I think we spend less now that we have a child. It’s hard to go out to eat with him…and we also pass up other activities that may be costly. And to those who say kids need this or that…all they really need are loving parents. Sure, kids can cost money but it’s not as expensive as some like to make it seem. We had to work really hard to become not boring after having our son, but our spending opportunities took a beating after he was born. These days we make it out to a few events, and we swap babysitting to make sure to have a low cost date night. All great advice! What I’ve found in preparing for our first baby is that it just doesn’t need to be anywhere near as expensive as our culture makes it out to be. There are ways to save money on just about everything in life–kids included! And, like you noted, thinking creatively about childcare is certainly a great idea. For little guys, childcare is easily the number one expense, so the more creative you can be, the better. I have some friends who do teacher job sharing, and they watch each other’s kids during the non-job sharing part. This way, they only have to pay for babysitters a few days a year. Daycare costs scare the hell out of me. Thankfully, if we do manage to get a kid, we’re home all day and have my in-laws in the guest house. So we should be able to avoid that expense, at least. No matter where you live, or how you do it, childcare is pretty expensive if you’re paying for full time care. If you can mete out the care among the varying adults, you can definitely save a lot of money without putting too much burden on anyone, and grandma daycare does tend to be very high quality (though some have said these kids tend to be spoiled). Thanks for this post! My husband and I don’t have kids yet, but I am hoping we will experience a clarification of and motivation for achieving goals. Like you did, we have kind of been mindlessly saving, but I’m sure we would have better results if we had more specific goals motivated by our family. Specific goals always yield better results, but I can guarantee that having a child will change everything for you. We were super mindless about money so even a nice conversation might have helped us. Time with your kiddo is a great first priority. It’s what they need most. And even though our finances shaped up after having our son, we still spend a good chunk of change on him. I definitely agree that getting pregnant really motivates you to take charge of your financial life and get serious about goal-setting. 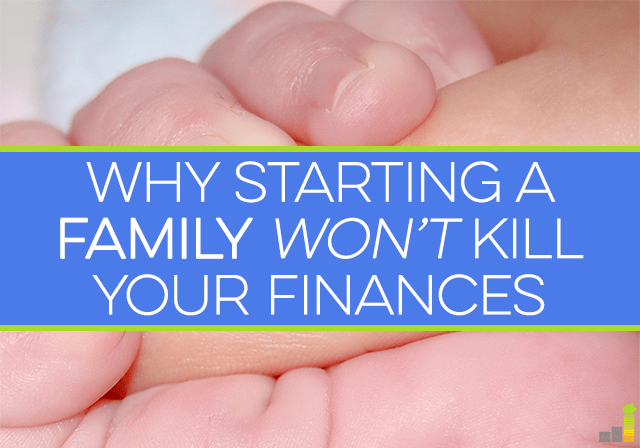 Starting a family isn’t something one should take lightly as it will affect your pocketbook but you are absolutely correct that you can decide how big of a dent it will take. I know when I was pregnant with Lauren (my first child) I definitely sucuumbed to some of those unnecessary purchases that a lot of first-time parents do, but I was a lot savvier the second time around. 🙂 I also found it much easier to make sacrifices when that money was going to better my daughters lives, whether it was saving for their college education or to enroll them in various activities. I agree! Kids definitely change your finances (and cost money), but I also find it’s easier to part with money spent on my son than on myself; I guess that’s whe savvy parenting comes into play. Having a kid really set us straight on our finances as well. You don’t need a new car and house just because you had a baby. They aren’t even that big! They aren’t even that big! I love that response. I’m also glad that I’m not the only person who straightened up financially when a child came on the scene.